If it looks like green juice, it’s healthy for you, right? 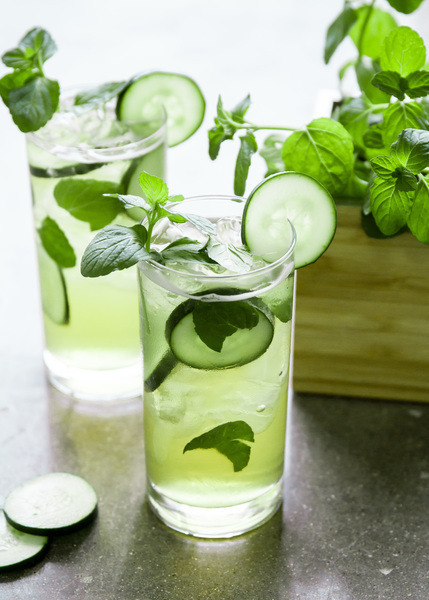 With a base of gin and cucumbers, this cocktail is refreshing, sweet, and finished off with a minty flair. Besides, it’s entirely green—just in time for St. Patrick’s Day! Combine the cucumber chunks, mint leaves, sugar, and lemon juice into a blender. Puree until smooth. Fill two glasses with ice. Add 2 oz of gin and thinly sliced cucumbers to each glass. Fill the glasses ⅔ full with cucumber puree. Top with club soda and stir well.